In New Zealand Backcountry Cooking we have included 30 pages on food planning and preparation which we see as a key point to successful cooking in the New Zealand outdoors. Menu Planning: this includes advice on meal preparation and planning. 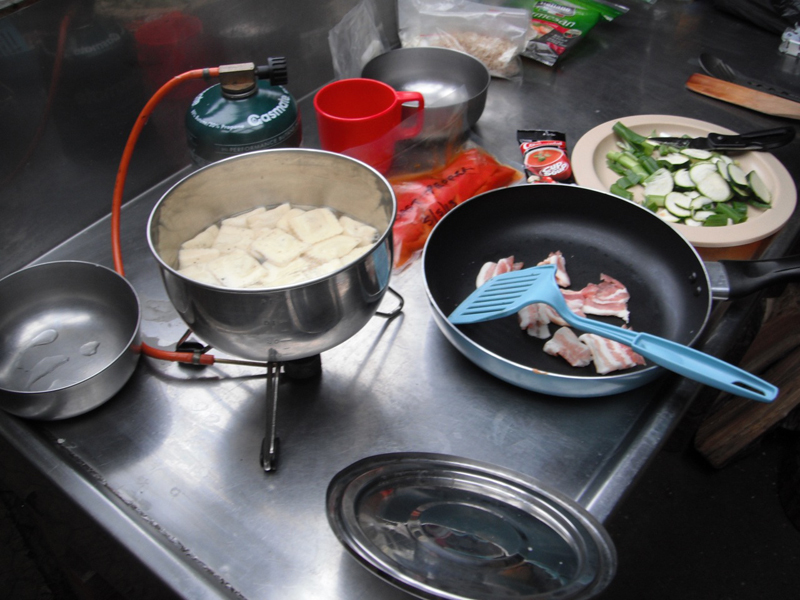 We outline cooking for small or large groups under camping type conditions. We have included a sample trip menus planner, including details on dry weights and volumes to pack. Food Packing: this includes a section on preparing and packing food at home, using a number of techniques from re-sealable plastic bags, through to using a vacuum packing machine. We also show how to deal with liquid and semi-liquid products. Fresh Food: we give advice on including fresh fruit and vegetables in your menu planning and how to include these for variety and flavour, while also setting out the best options for using meat (fresh, semi-fresh and dried) in your backcountry cooking adventure. Dehydrated Food: we explore the options of preparing your own dehydrated food at home and the advantages of including these in many of your camping recipes. There are step-by-step instructions for dehydrating many foods not commonly available in local shops; like dehydrated Red Peppers, dehydrated Lemon Chicken and dehydrated Smoked Fish. Flavour Boosters: if you want to take the blandness out of boring camp food, then including some of the fantastic flavour boosters we have highlighted in this section will do the trick. From fresh herb pesto to caramelised onions we have plenty of great flavour boosters to choose from.